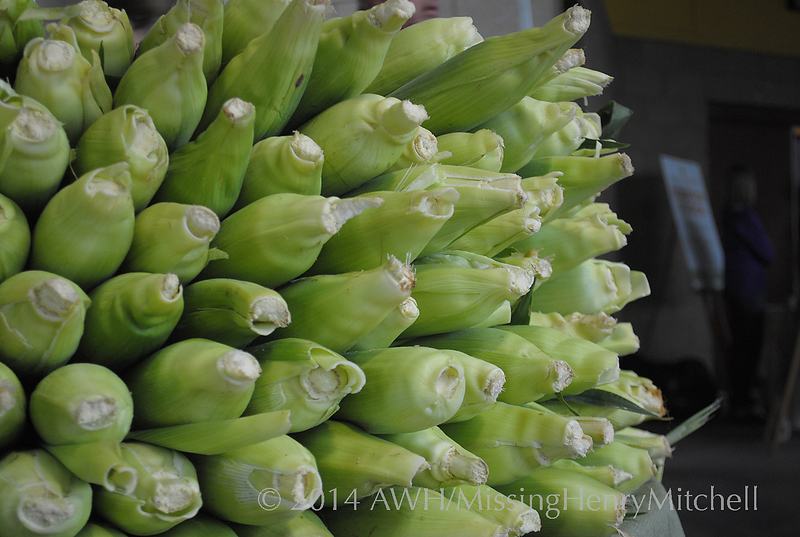 It’s a dreary, gray day today, but a visit to the farmers’ market brought all the color my eyes could want. 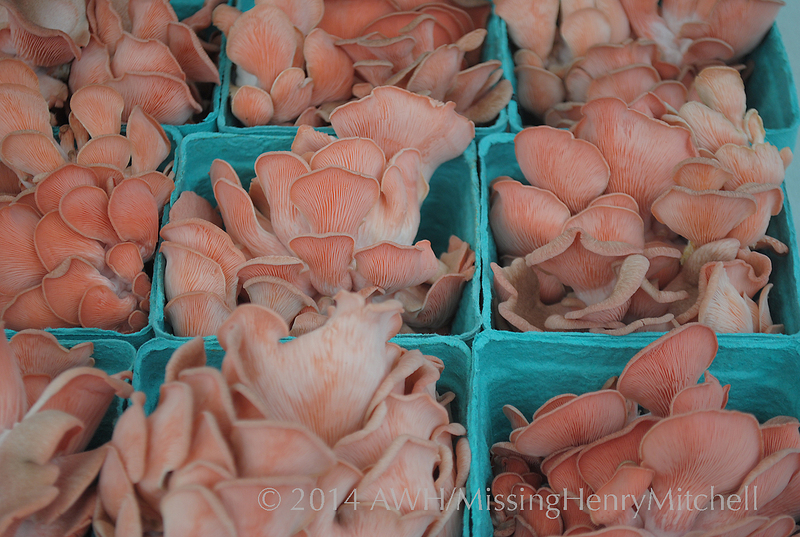 I had never seen pink oyster mushrooms before. And hurrah! 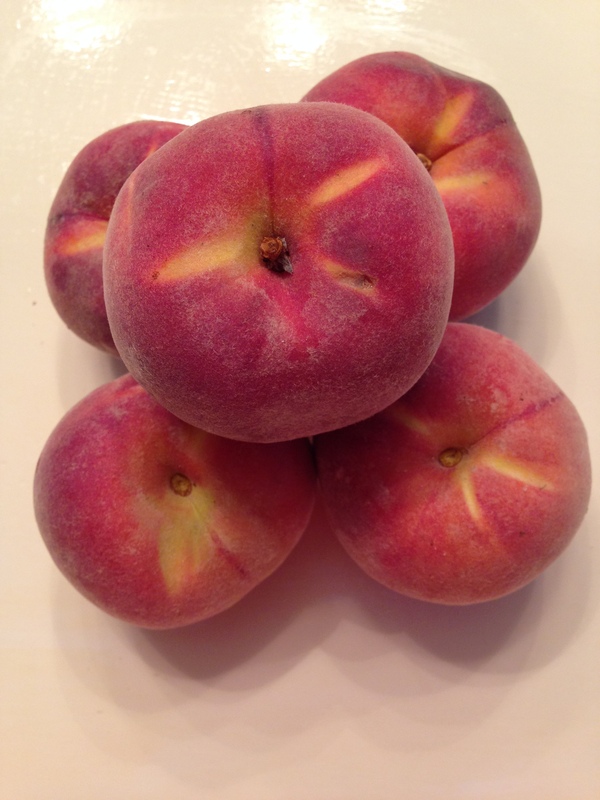 It’s peach season. I’m fixing my favorite salad for lunch. Here’s the recipe. Wash the lettuce and greens and tear or cut them into bite-size pieces. Wash and halve the peach, removing the pit, then dice the peach. 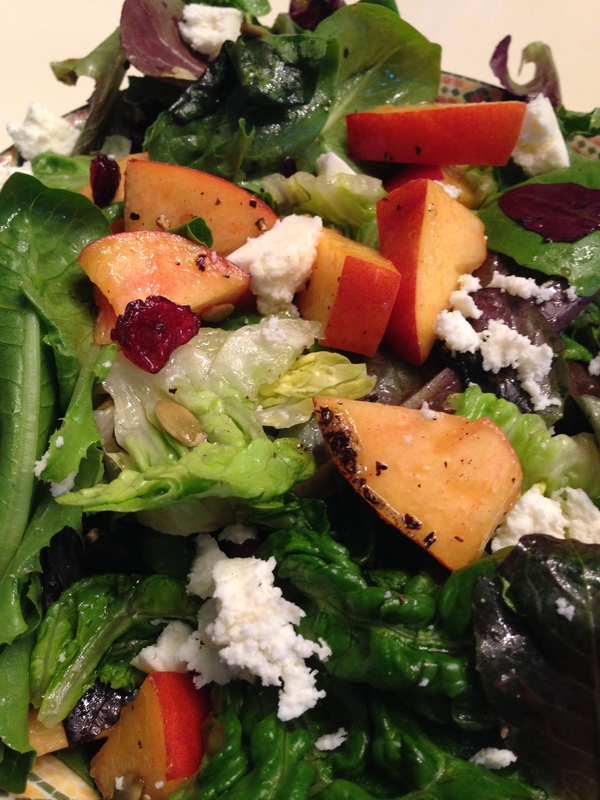 Add the peach, the pumpkin seeds, the cranberries, and the queso fresco to the greens. In a separate bowl, whisk together the olive oil and red wine vinegar. Add kosher salt and pepper to taste. Drizzle the greens mixture with the olive oil dressing (you may not use all of the dressing). Mix well but gently, using your hands to ensure a thorough coating. Enjoy with a piece of crusty bread. Peas are not easy for me to grow. I suppose the key to success lies in timing the sowing just right, because springs here can go from frigid to tropical in very short order. 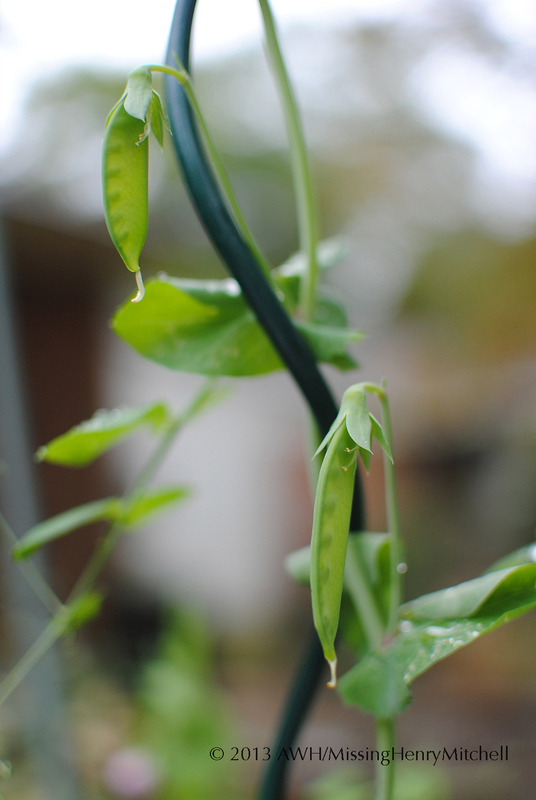 But fall weather is somewhat more reliable, and this year I successfully grew sugar snap peas in containers. I’ve just pulled out the last of the vines, which are going into the compost pile. One of my family’s favorite dishes makes wonderful use of sugar snap peas: Nigella Lawson’s recipe for sesame peanut noodles. 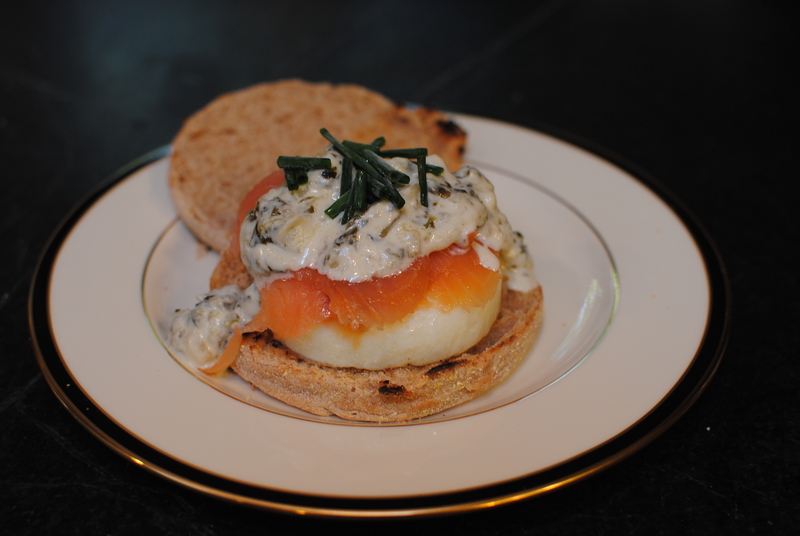 As she notes, this is a great dish to have in the fridge for quick lunches. I make a few modifications to her recipe. My dressing is the same: combine 1 tablespoon each of sesame oil, garlic oil, and soy sauce, 2 tablespoons each of lime juice and chili sauce, and 100 grams (1/3 cup) of peanut butter. Combine all ingredients until smooth. Natural peanut butter is best, hands-down. When I don’t have garlic oil, I use canola oil instead, and mix about 1 tablespoon of chopped, seared garlic to the noodle mixture. 1–1 1/2 cups of fresh snow peas (I had no idea what “mangetout” was). 2 ribs of celery, chopped haphazardly into small pieces. 3/4 pound of whole-wheat pasta, cooked (my family doesn’t like egg noodles). On the side: chopped cilantro, alfalfa or bean sprouts, sesame seeds, and red chili flakes, for those grown-ups in the house who like such things. Boil 1 quart of water in a saucepan. 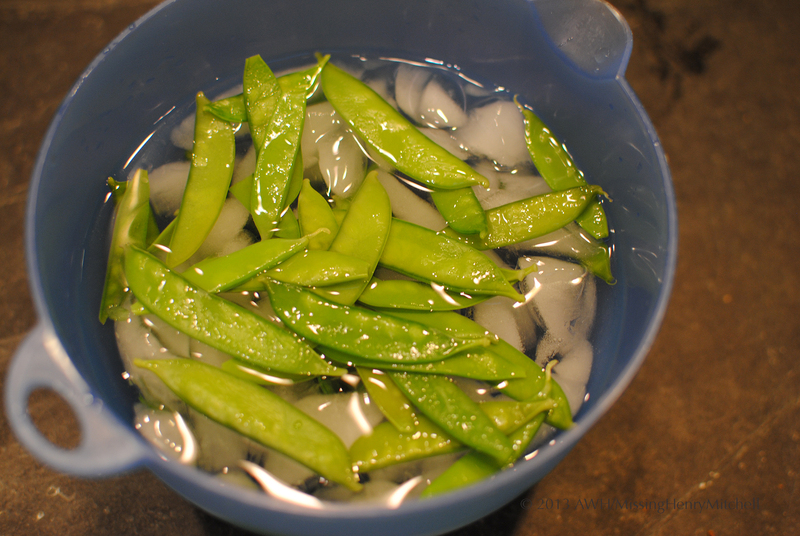 Wash the snow peas and plunge them into the boiling water for perhaps 10-20 seconds, then drain and plunge immediately into a bowl of ice water to stop the cooking. 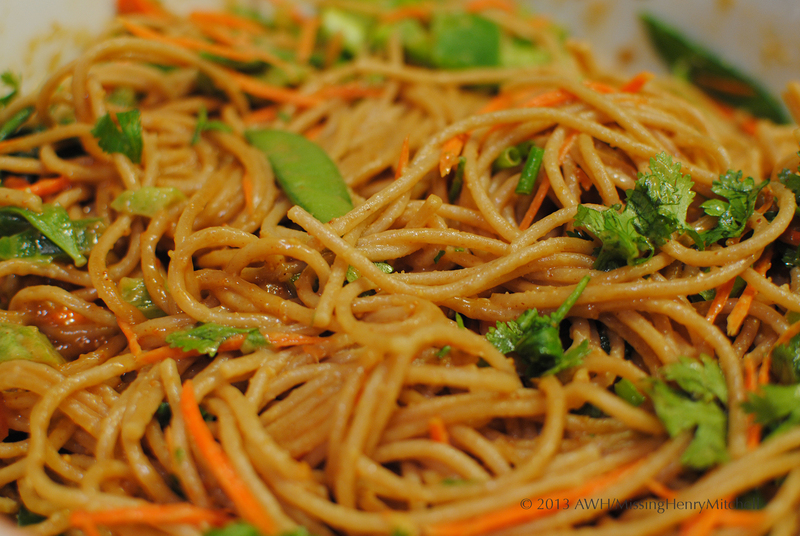 In a large bowl, combine the cooked pasta, the blanched snow peas, and the peppers, onions, carrots, and celery. 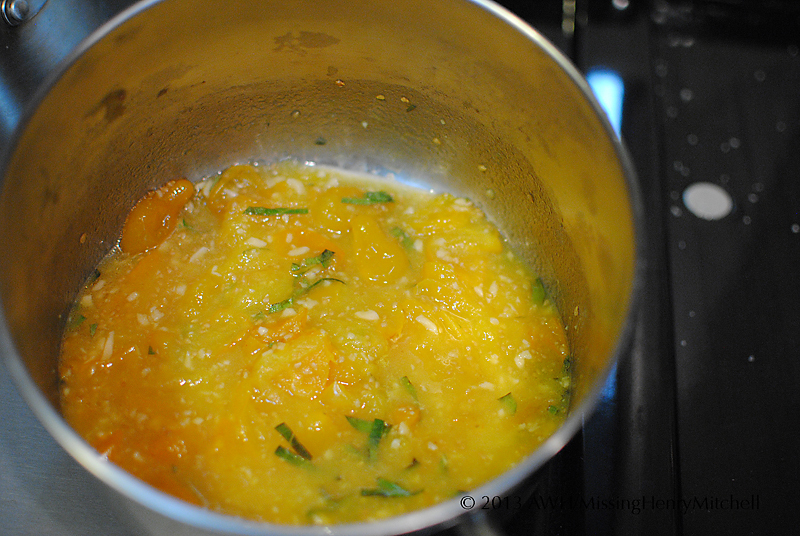 Add the dressing slowly, stirring with a spatula until all ingredients are lightly coated. I seldom use all the dressing; perhaps I’ll reduce to 1/4 cup of peanut butter and 2 tsp. each of the oils. Garnish as you like with sesame seeds, nuts, chili flakes, etc. This recipe easily serves 10-12 and keeps well in the fridge. My friend gave me a clump of sorrel last year. I planted it promptly, and have done nothing with it. We don’t eat much sorrel around here. I don’t see it in the supermarket or the farmer’s market. 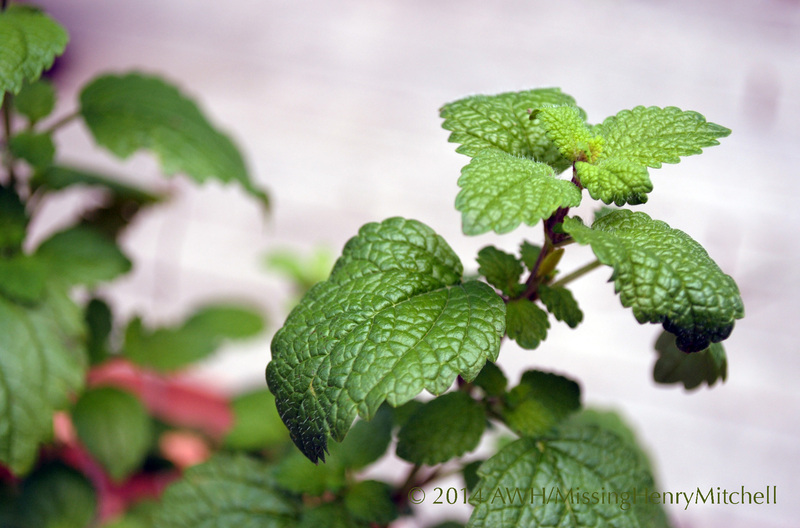 But it is the best kind of vegetable: a perennial that doesn’t require much in the way of care. I can tell it has been sampled rarely by a slug or snail, but I suppose it is too tangy for them to truly enjoy. I have not seen any sign of disease, despite the generous helping of neglect I have given it. I did a bit of searching around to find a recipe worth trying. The Splendid Table never lets me down. I made the recipe for one, which was actually worth the trouble. I started by roughly chopping the shallot. I’m not a chef; I don’t produce lovely square mince, especially when I’m cooking for myself. Next year, the shallots will come from my garden. 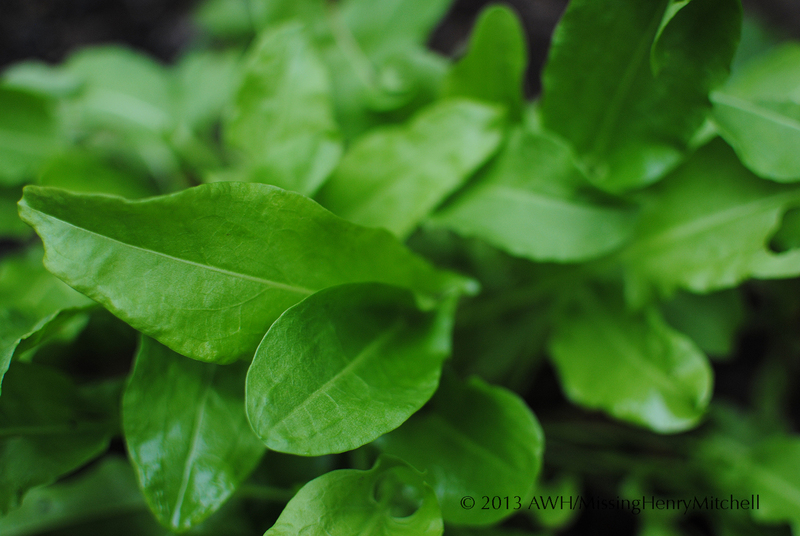 I picked and washed a handful of sorrel leaves and chopped them roughly. I couldn’t find crumpets at the market, but I did find whole-wheat English muffins. I started the sauce, browning the shallot and half the sorrel in butter. The sorrel cooks down instantly into a kind of slime-colored pulp, but do soldier on. Add the cream and salt. I used light cream instead of heavy. Then I started poaching the egg. Not being the patient type who will turn an egg over and over in the water, I sprayed a ramekin with cooking spray and cracked in the egg. Tip: Contrary to the recipe, start the egg before starting the sauce. The sauce cooks instantly and adhered to the pan. Fortunately, it was nothing a little white wine couldn’t cure. And maybe a dollop more butter. A little bit of deglazing, and it’s time to assemble and eat. I garnished with the chives I harvested and froze a few weeks back. The whole process took perhaps ten minutes, and the result was outstanding. It’s amazing how a little culinary effort can turn the day around. I felt like a civilized person as I sat down to eat–something I don’t typically feel before feasting on a cold turkey sandwich. 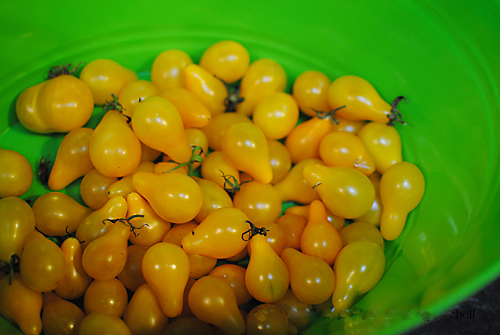 In the community garden where I work, yellow pear tomatoes grow abundantly. They don’t seem to be terribly popular, though, with many people besides me. I adore them. The plants produce abundant fruit that ripens quickly. The delights of popping them straight into the mouth from the vine are well known and do not need to be recounted here. And it’s far less devastating to find one infested cherry tomato in a cluster of otherwise-fine fruit than it is to anticipate harvesting that one big slicing tomato you’ve been nursing along, only to find that on the back side of the fruit there’s a huge, oozing hole edged with gray-green fur. I came home last week with two healthy pints of fruit, to add to the remainder of the two quarts I had from last week which we haven’t finished yet. 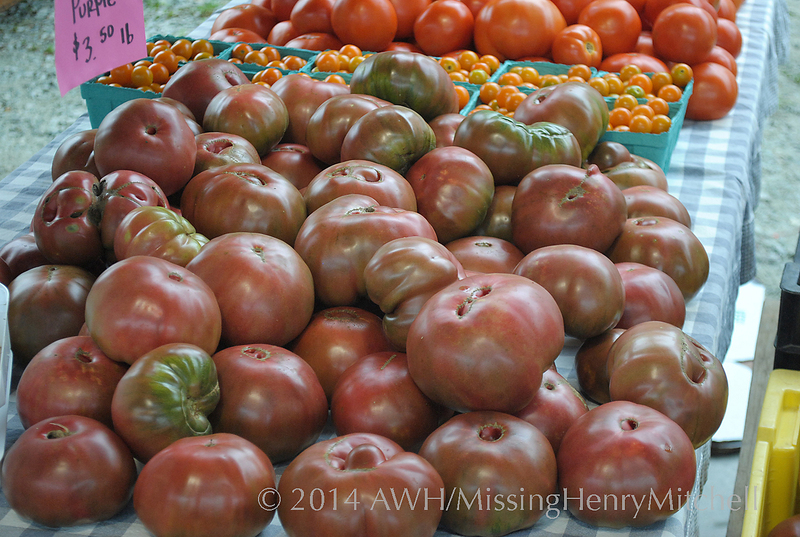 The tomatoes will never be as good as they are right now–unless, perhaps, they’ll save in a sauce? I’ve never tried making a sauce with cherry tomatoes. Time for an experiment. I should note that I have no experience in canning. That’s a project for another season, after much study on food safety. But freezing is the one technique of food preservation in which I feel competent, and I have a big freezer. This recipe is easiest in a crock pot or slow cooker, but I’m also providing regular-oven instructions. 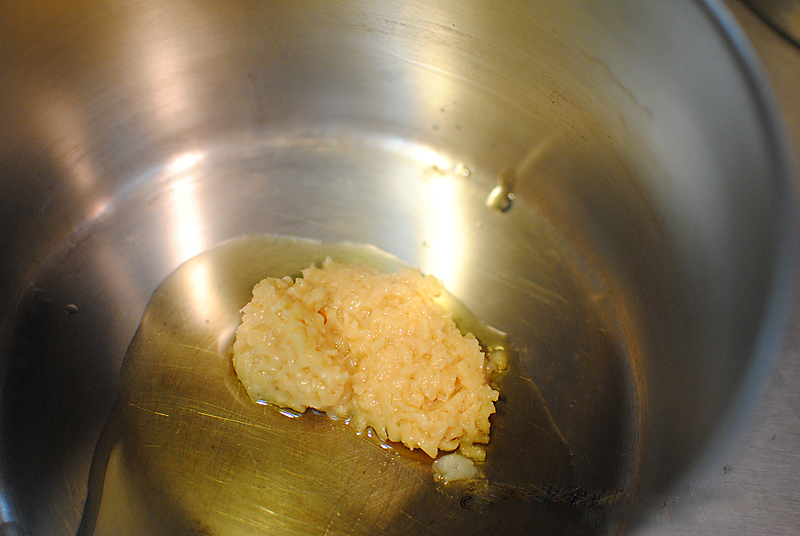 In a medium saucepan, I warmed about three tablespoons of olive oil. 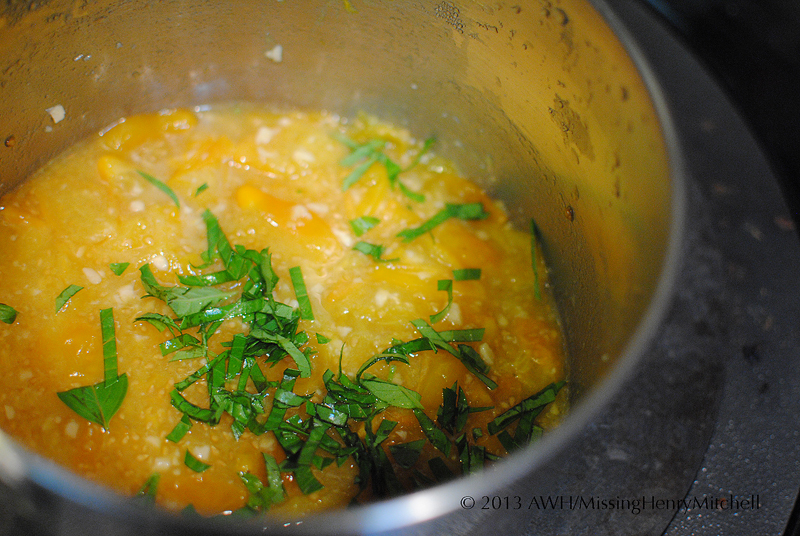 To that, I added three tablespoons of chopped organic garlic from a jar. I love garlic. Next year, it will be my home-grown garlic, but we all must start someplace. If you don’t like garlic as much as I do, just add a little less. I washed and capped the tomatoes, and sliced them in half. I didn’t bother to peel them (can you imagine?). I then added the tomatoes to the pan, covered it, and left it in a warm oven (250-275 F, 121-135 C) for two hours to slowly melt together. For the final 30 minutes, I snipped in a tablespoon’s worth of the last fresh basil leaves I’ll see this year, and stirred in a pinch of coarse salt. This sauce is glorious, and utterly simple. When it cooled, I poured it into a small, clean glass jar and froze it. I hope it tastes just as good in January! It is entirely fair to say that as a grower of fruit at home, my ambition and enthusiasm exceed my talent and success. So when I happened to look out the window just before lunchtime and saw that my fig tree, which is three feet tall and not impressive, had some fat, ripe fruit on offer, I had no qualms about seizing the opportunity. (Plus, I don’t think the other residents of my home care for figs). I harvested four figs; the first edible treats of fall. Sprinkle the crumbled goat cheese on the bread and put it in the oven to toast. Wash and slice the apple and figs. 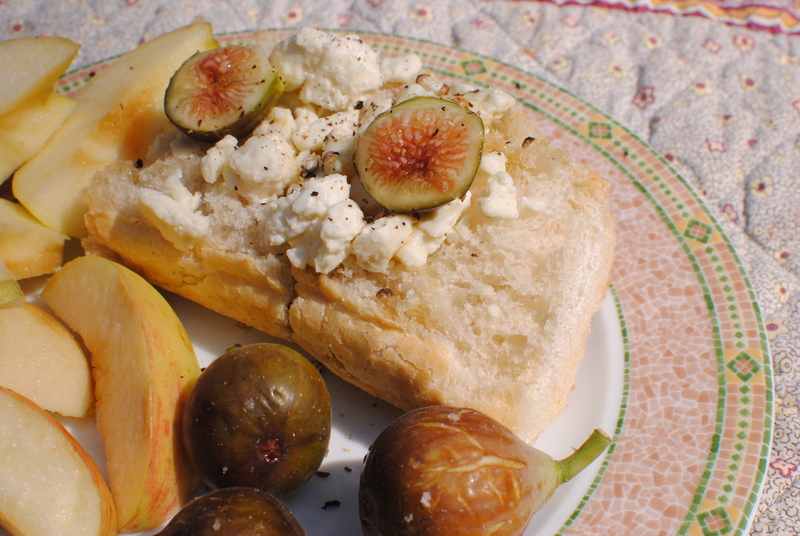 When the bread is golden and the cheese is soft, remove the cheese toast from the oven, top with figs and apple slices. Drizzle with honey and a pinch of freshly ground black pepper. Slow down and savor.